The other bread I am making for this weekend’s tea party is a carrot bread with crystallized ginger. This one I will be making exclusively using the bread machine. One nice thing about this bread is that there is no need to add sugar. The carrots themselves are sweet enough and the bits of crystallized ginger will also add a hint of sweetness. 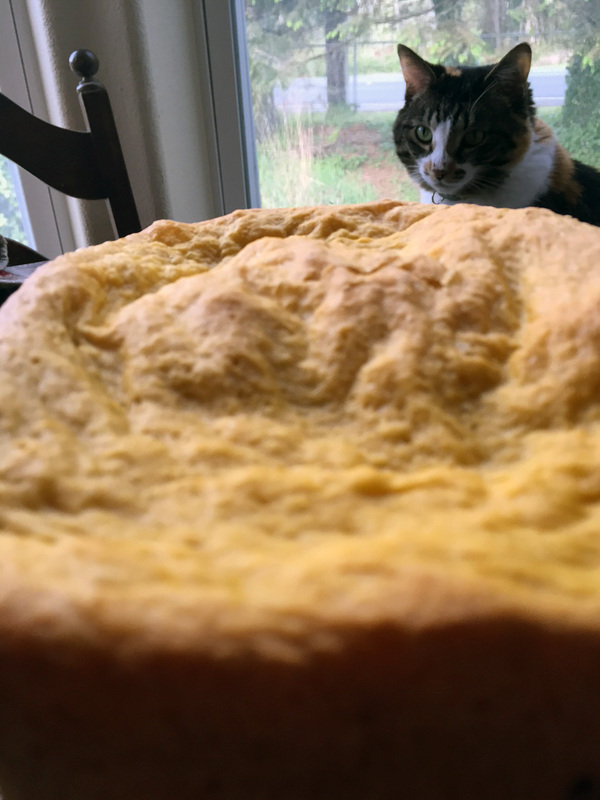 According to the recipe, the ginger will “melt into the bread and burst with flavor in your mouth.” Sounds good, doesn’t it? 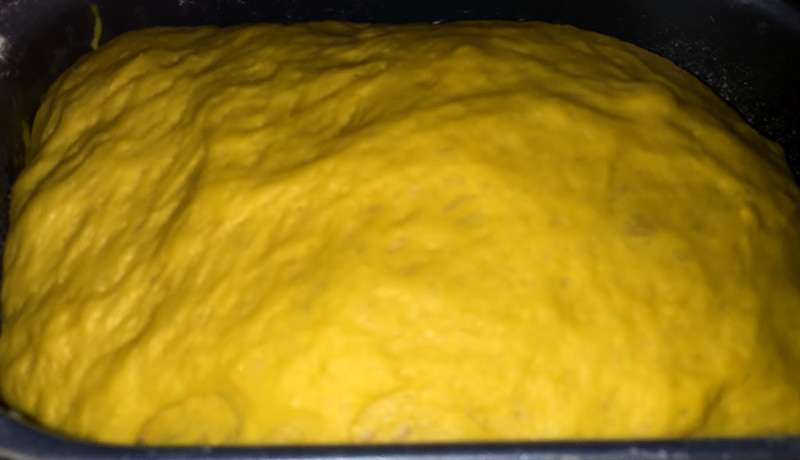 Ingredients for this bread include fat free milk, pureed carrots, eggs, unsalted butter, bread flour, crystallized ginger, gluten, salt and yeast. The recipe allows for the option of using baby food strained carrots, or pureeing your own. Using a jar of baby food would be convenient, but because I can’t digest a lot of vegetables, I like to puree my own and keep them on hand for adding to soups, stews, sauces, meatloaves, and more. I have no shortage of pureed vegetables on hand. 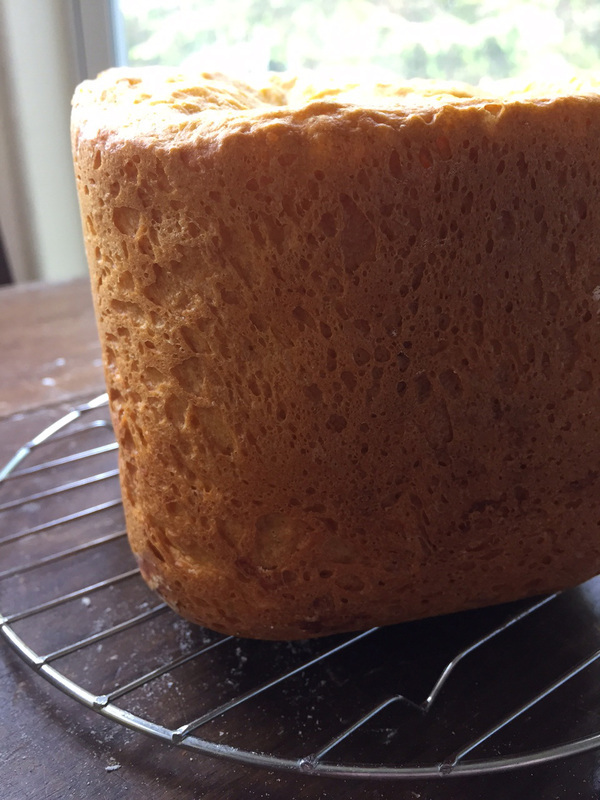 Because of that, this recipe has me thinking of other combinations I can try in the future, pureed broccoli and cheddar bread, spinach with bacon and nutmeg. I am sure the possible combinations are endless and I will have plenty of time to come up with more. It looks like it is rising well, and what a pretty color! Oh crumb (pun intended,) I’ve got another crater loaf. It is still a really lovely color, though and smells just like fresh carrots. As you can see from the pictures, even November thinks it is pretty in spite of the crater top. (Please take note, she is on the windowsill behind the table, not ON the table.) At least my friends at the tea party will appreciate the effort. They love me for my sparkling wit and not my baking chops. (Although I am certainly working on that.) Again, because I won’t be slicing into this until the party this weekend, I will have to update the post later with everyone’s opinion. This was really delicious. 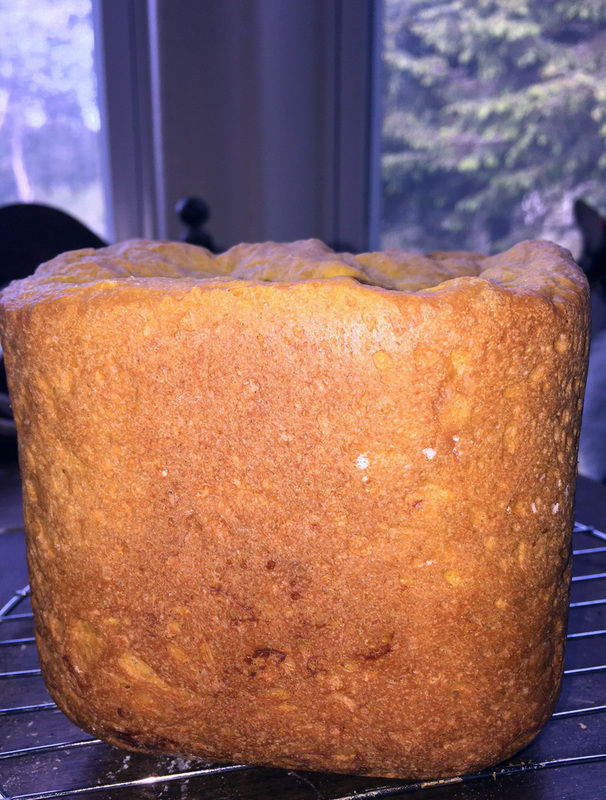 The carrot bread itself is tasty enough, but the sweet surprise bits of crystallized ginger put this one over the top. One guest used “delicate” to describe it while another asked for the recipe. (It’s coming, Melissa.) This went well with our tea and a little butter. I seem to remember seeing someone try it with the orange curd as well.